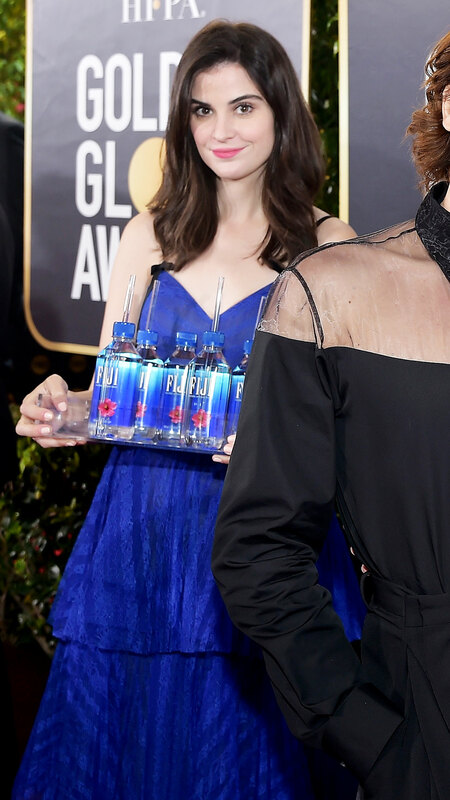 After much sleuthing, the waitress who stole the spotlight on the red carpet at the 2019 Golden Globe Awards — and subsequently became known as the “Fiji Water Girl” — has been identified. The 5-foot-9 model amused many viewers at home as she shamelessly posed behind stars including Amy Adams, Dakota Fanning, Luke Evans and Idris Elba. After her identity was revealed, Cuthbert poked fun at her newfound title on Instagram, writing, “Not the worst way to spend a Sunday… #goldenglobesfijigirl #fijiwatergirl.” Her post racked up more than 32,000 likes. According to Cuthbert’s website, she has modeled for agencies across North America, including Wilhelmina in Los Angeles and Chicago, Plutino in Toronto, Heffner in Seattle and Donna Baldwin in Denver. She has even worked with East West in Frankfurt, Germany. The brunette hails Toronto, but she currently lives in Los Angeles. She told Glamour after the Golden Globes that she used to be a social worker, specializing in mental health and addiction counseling, before deciding to fully commit to modeling. The viral sensation had about 53,000 followers the morning of the awards show, but she now has more than 84,000 and counting. She told the magazine that she has received hundreds of texts and DMs.